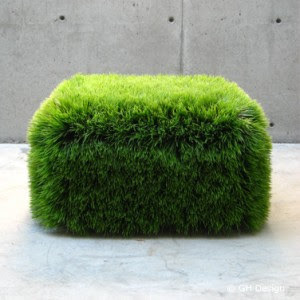 This fabulous ottoman by GH design is great if you're looking for a chic way to bring your fashion sense outdoors. The entire square is "upholstered", as you might say, in grass. Which means for a luncheon on the green you hardly have to leave your front door. Try pairing a couple on either side of a white wire wicker table for instant tea-time glam, or place a few scattered about a cement entryway for a green-conscious contemporary vibe.